The right food during exercise maximizes the physiologic effects to the body. When it comes to the benefits of yoga, certain foods help optimize the positive effects in the body through the combination of right food and activity. When you are employing yoga, you may want to intensify your exercise experience by including certain foods to your diet. Coriander is one of the oldest spices in the world. It is a native to Asian and Mediterranean countries. Coriander has medicinal properties and has been used by Hippocrates as an aromatic stimulant. Coriander also contains phytonutrients to help eliminate free radicals intensifying the antioxidant effects of yoga. Asafetida or ferule persique in French is a resin extracted from a plant root. It leaves an onion-like flavor, but it generally has a stinking and pungent odor when uncooked. It contains high amounts of phosphorus and calcium to enhance bone density, which is another objective of yoga. Turmeric is a popular Indian spice. It is also available in other countries with the name haldi, kurkuma, or curcuma. Turmeric powder is one of the essential spices in Ayurvedic medicine and it has a distinct peppery and warm flavor similar to the native ginger. Turmeric contains a rich source of manganese and iron best for improving oxygenation and muscle contraction among those employing yoga. It is also a heating spice, which increases metabolism and weight loss best for those who employ yoga for weight reduction purposes. If you are fond of spicy foods, adding red chili to your recipe is an excellent way to maximize the benefits of yoga. Red chili is very rich in beta carotene, dietary fiber and vitamin C for a more effective antioxidant effect and immunity enhancement. It also enhances weight loss. Cumin seeds are another additive you can add to your recipes while doing yoga or just any other exercise. 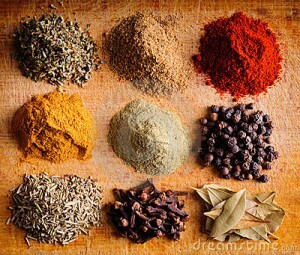 It is known as a cooling spice, which is especially beneficial when doing exercises such as yoga. It also improves digestion and flushing out of toxins and is very rich in manganese and iron for improved immunity. If you are looking for an excellent source of vitamin C, fennel seeds are very rich with this. Like cumin seeds, it has a cooling effect on the body best for yoga. For a more effective yoga, it also contains potassium and manganese for improved muscle and heart contraction. Mustard seeds are very rich in omega 3 fatty acids and selenium essential for lowering the cholesterol levels in the body. Aside from this, it has anti-inflammatory, laxative, antiseptic and digestive properties. Adding these spices and seeds in your recipe can help optimize your yoga experience. The human condition requires vast physical, emotional and mental needs for a more holistic life experience.